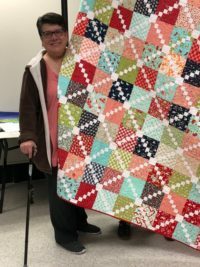 Members are encouraged to share their love and expertise in quilting, and be active participants in the guild. Each month members receive the guild newsletter, Sew Much News, by email or in the mail. It contains minutes of the business meeting and news of upcoming events, programs, retreats, and workshops. The guild has an extensive library for use by its members along with many guild activities. The purpose of the guild is to preserve the heritage of quilt making and to further educate the membership in the art of quilting making. Dues are $40 per year payable September 1st.